Astronomers can't see “Planet Nine.” But it makes its presence known. The massive hypothetical object, which supposedly looms at the edge of our solar system, has been invoked to explain the strange clustering of objects in the Kuiper belt and the unusual way they orbit the Sun. Now Planet Nine predictors Konstantin Batygin and Mike Brown of Caltech, along with graduate student Elizabeth Bailey, offer another piece of evidence for the elusive sphere's existence: It adds “wobble” to the solar system, they say, tilting it in relation to the sun. “Because Planet Nine is so massive and has an orbit tilted compared to the other planets, the solar system has no choice but to slowly twist out of alignment,” lead author Bailey said in a statement. The new research led by Bailey is based on the observation that the sun rotates on a different axis than the orbits of the planets. Mercury, Venus, Earth, Mars, Jupiter, Saturn, Uranus and Neptune all move around the sun in a flat, shared plane — it's as if the planets were skaters on the same rink. But that plane is tilted at a six-degree angle with respect to the sun (which, from our perspective, makes it look like the sun is tilted). This tilt doesn't jibe with how astronomers say the solar system formed: 4.6 billion years ago, gravity started to pull together a vast, scattered cloud of gas and dust, causing it to spin into a disk. The center of the circle collapsed into a hot, dense ball of gas — the sun — and the remainder accumulated into planets. Because the sun came from the same disk as everything else, it should be spinning on the same plane. But it's not. “It's such a deep-rooted mystery and so difficult to explain that people just don't talk about it,” Brown said. Enter Planet Nine. Based on Batygin and Brown's previous calculations, the hypothesized planet weighs five to 10 times as much as Earth and is, on average, 20 times farther from the sun than Neptune. It takes Planet Nine 10,000 to 20,000 years to orbit the sun. The study was posted in the online research database ArXiv, and will be published in the Astrophysical Journal this year. According to Batygin, the research is a “consistency check” for their theories about Planet Nine. It provides another piece of evidence for the planet's existence, but it doesn't change our understanding of it or make it any easier to find. He, Bailey and Brown also don't know why the planet's orbit would be so off-kilter in the first place — perhaps it was knocked askew by Jupiter, or was influenced by the gravitational pull of other stars. Most of all, they need to find the darn thing. Scientists have a sense of its orbital path, but that path is thousands of years long. Even with some of the most powerful telescopes scouring the skies, it could be a very long wait. 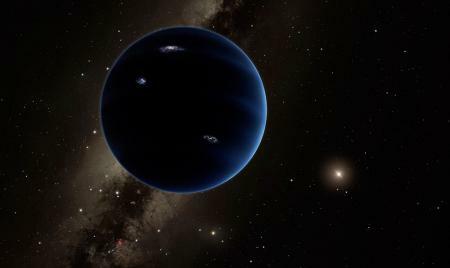 Astronomers Have Announced The Discovery Of Giant "Planet X"